A study of older adults at increased risk for Alzheimer’s disease shows that moderate physical activity may protect brain health and stave off shrinkage of the hippocampus– the brain region responsible for memory and spatial orientation that is attacked first in Alzheimer’s disease. 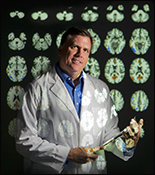 Dr. J. Carson Smith, a kinesiology researcher in the University of Maryland School of Public Health who conducted the study, says that while all of us will lose some brain volume as we age, those with an increased genetic risk for Alzheimer’s disease typically show greater hippocampal atrophy over time. The findings are published in the open-access journal Frontiers in Aging Neuroscience. “The good news is that being physically active may offer protection from the neurodegeneration associated with genetic risk for Alzheimer’s disease,” Dr. Smith suggests. “We found that physical activity has the potential to preserve the volume of the hippocampus in those with increased risk for Alzheimer’s disease, which means we can possibly delay cognitive decline and the onset of dementia symptoms in these individuals. Physical activity interventions may be especially potent and important for this group.” Dr. Smith and colleagues, including Dr. Stephen Rao from the Cleveland Clinic, tracked four groups of healthy older adults ages 65-89, who had normal cognitive abilities, over an 18-month period and measured the volume of their hippocampus (using structural magnetic resonance imaging, or MRI) at the beginning and end of that time period. The groups were classified both for low or high Alzheimer’s risk (based on the absence or presence of the apolipoprotein E epsilon 4 allele) and for low or high physical activity levels. Of all four groups studied, only those at high genetic risk for Alzheimer’s who did not exercise experienced a decrease in hippocampal volume (3%) over the 18-month period. All other groups, including those at high risk for Alzheimer’s but who were physically active, maintained the volume of their hippocampus. “This is the first study to look at how physical activity may impact the loss of hippocampal volume in people at genetic risk for Alzheimer’s disease,” says Dr. Kirk Erickson, an associate professor of psychology at the University of Pittsburgh. “There are no other treatments shown to preserve hippocampal volume in those that may develop Alzheimer’s disease. This study has tremendous implications for how we may intervene, prior to the development of any dementia symptoms, in older adults who are at increased genetic risk for Alzheimer's disease.” Individuals were classified as high risk for Alzheimer’s if a DNA test identified the presence of a genetic marker – having one or both of the apolipoprotein E-epsilon 4 allele (APOE-e4 allele) on chromosome 19 – which increases the risk of developing the disease. Physical activity levels were measured using a standardized survey, with low activity being two or fewer days/week of low intensity activity, and high activity being three or more days/week of moderate to vigorous activity. “We know that the majority of people who carry the E4 allele will show substantial cognitive decline with age and may develop Alzheimer’s disease, but many will not. So, there is reason to believe that there are other genetic and lifestyle factors at work,” Dr. Smith says. “Our study provides additional evidence that exercise plays a protective role against cognitive decline and suggests the need for future research to investigate how physical activity may interact with genetics and decrease Alzheimer’s risk.” Dr. Smith has previously shown that a walking exercise intervention for patients with mild cognitive decline improved cognitive function by improving the efficiency of brain activity associated with memory. [Link to http://www.umdrightnow.umd.edu/news/exercise-may-be-best-medicine-alzheimers] He is planning to conduct a prescribed exercise intervention in a population of healthy older adults with genetic and other risk factors for Alzheimer’s disease and to measure the impact on hippocampal volume and brain function. “Physical activity reduces hippocampal atrophy in elders at genetic risk for Alzheimer’s disease” was written by J. Carson Smith, Kristy A. Nielson, John L. Woodard, Michael Seidenberg, Sally Durgerian, Kathleen E. Hazlett, Christina M. Figueroa, Cassandra C. Kandah, Christina D. Kay, Monica A. Matthews and Stephen M. Rao and published in Frontiers in Aging Neuroscience.